Spray applied polyurethane foam for barn insulation is a modern, cost effective solution, which allows you to retain characteristic period features of barns whilst providing excellent insulation. Handi Foam DIY spray foam kits bring this project within the reaches of the average DIY person. The construction of barns varies considerably, some being stone built, others of wooden construction, and some a combination of the two. As barns were never designed with the eventual accommodation of humans in mind, little thought was given to warmth. With more and more barns being converted to living accommodation, the need to insulate barns adequately has become important. An ideal insulating material for barns would allow the period features to be preserved and displayed and should be quick and easy to fit. Unfortunately many old wood framed barns have uneven joists. This is mainly due to outdated woodworking techniques and also bowing of timbers over the years. This makes the installation of traditional board insulation an absolute nightmare! Modern insulation boards are accurately cut to fit between modern joists with standardised spacings. Thus most boards will have to be cut to fit, and will require sealing around the edges after fitting. This greatly increases the time insulate the building, and increases wastage (from off-cuts). This ultimately translates into higher insulation costs. 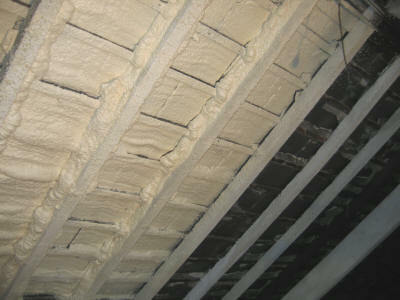 Spray Foam eliminates all these problems and makes insulating barns and buildings a simple process. 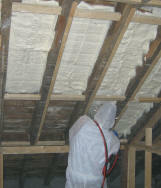 The foam insulation is sprayed directly onto the interior walls and roof of the structure. 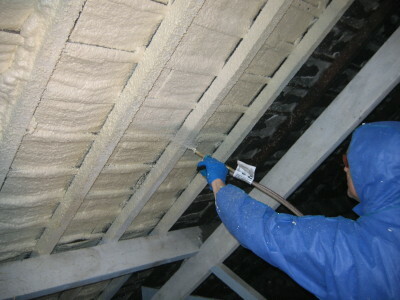 In the above picture, the foam has been sprayed between the beams. Once the cured foam is faced with plasterboard or rendered, the beams will remain partially exposed thus retaining one of the key period features of the building. This method of insulating buildings is far simpler and more cost effective than traditional insulating methods. Agricultural barns benefit enormously from spray applied insulation. Polyurethane spray foam sticks very well to most surfaces including metal, wood and asbestos type materials. Insulating livestock barns can reduce mortality rates and at the same time lower heating bills considerably. Elimination of condensation on the inside of the structure improves hygiene and reduces spoiled produce in crop stores. One of the challenges of a successful residential barn conversion is retaining period features like exposed beams. It is difficult to leave beams even partially exposed with traditional insulating materials like rock-wool, especially with proposed amendments to building regulations. Spray applied foam barn insulation is simple to apply with Handi-Foam DIY spray foam packs. Follow the links on the left at the top of the page to visit our product & prices page and to find out more about doing it yourself. 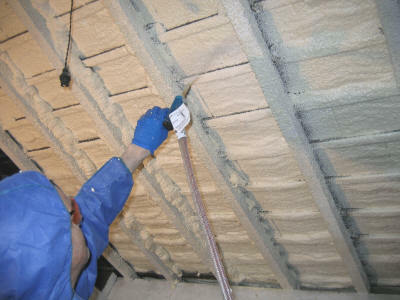 Insulation does not need to cost as much as you think it does if you do it yourself.